The Movement, a Black Faculty, Staff, and Student Association-affiliated student coalition, held a retreat recently for the executive officers and delegates of the Student African American Brotherhood (SAAB), Student African American Sisterhood (SAAS), Black Student Union (BSU), Pan African Stem Society (PASS), and all National Pan Hellenic Council (NPHC) Greek-letter organizations. 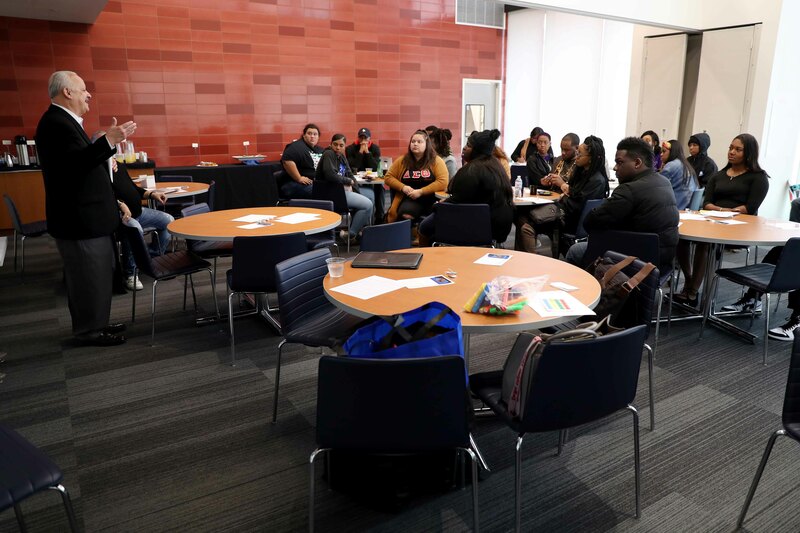 The retreat, held on Jan. 12 on campus, was designed to reconnect the student leaders on core principles of support, retention and communication in support of the African American student population at Cal State San Bernardino. The retreat was also designed to be a catalyst for future action-oriented professional development of all invested student leaders of The Movement. CSUSB student Janessa Celestine (left) was one of the participants at The Movement Executive Retreat on Jan. 12 at CSUSB. Kyle Wachuku (right), a CSUSB student majoring in economics, at The Movement Executive Retreat on Jan. 12 at CSUSB. CSUSB President Tomás D. Morales addresses student leaders at The Movement Executive Retreat.